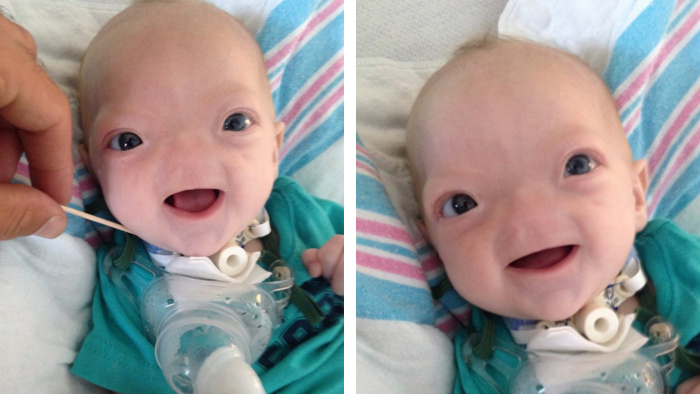 This adorably cute baby named Eli Thompson, is a 1 in 10 Billion baby. He was born with a rare condition known as Congenital Arhinia. It is a condition where the baby is born without a nose, and it is so rare there have only been 30 cases reported so far. Brandi, and Troy Thompson were not aware there was anything different about their baby until after he was born, because nothing showed up on the ultrasound. At birth Brandi and Troy were totally surprised to see their baby did not have a nose. A tracheotomy was done to help him breath better, and Eli will be going through more surgeries in the future. He requires close monitoring, and he cannot cry so his parents have to keep a close eye on him. Brandi will not be returning to work as expected, so if anyone would like to help with Eli’s medical expenses which will be ongoing, there is a gofundme account set up just click this link gofundme or visit his facebook page to learn more. facebook This perfect, and gorgeous baby, has certainly stolen our hearts. Brandi, Troy, and Eli, our prayers are with you, and we wish you health and happiness.